Why I'm Playing At Party Poker So Much. I may regret letting you in on this one, but whatever, I guess I'm too helpful/cool/handsome for my own good. Basically, I've been playing exclusively at Party Poker for the last few months. Why? Because I'm winning a hell of a lot more money than I have been at any other poker room. I've definitely been playing elsewhere for far too long. Why am I winning so much more money? Because the players are absolutely terrible. Seriously, it's incredible. This is a graph of poker player data from the top online poker rooms. Party Poker has been proven to have the worst players by some margin. Cool huh? Why are the players so bad? Honestly, I don't really know. I'm just making the most of it while I can. The design. The PartyPoker logo and software is colourful and fun. It looks like someone took a normal poker table and dropped a bag of Skittles and a rainbow on it. I guess that attracts the innocent, yet ultimately useless type of player. You know, like old people and the noobs that have just decided to play online poker after beating a few of their friends in the last home game they played. No US players. 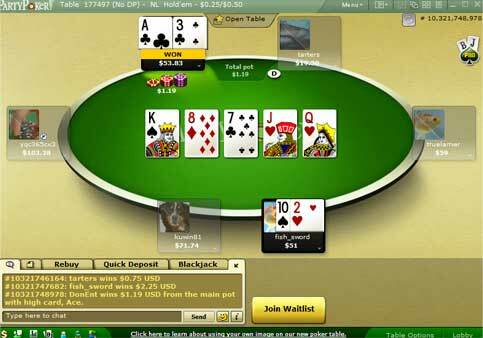 Although it's legal in most states, many US players are worried about playing online poker. So, the only ones that play online poker in the US are the ones that know what they are doing and know how to play poker well. Non-US poker rooms are protected from all these annoying players. Online casino gamblers. Party Poker also runs a very popular casino (called "Party Casino" -- who'd have thunk it?). Casino players are total gamblers, and these players regularly drop in to the poker room to play for real money. They enter the poker room expecting to lose, and almost always keep playing until they do. Those are my awesome theories. But whatever the reasons, Party has become home to a crazy number of bad players, and a haven for the few that have found out about it (like me). If you like winning money, yes. A screenshot of my balance after my first quick session playing $25NL. Now sure, this is hardly the most impressive win over 2 hours. Far from it. The crazy thing though was that I wasn't just getting lucky and winning coinflips. I won the best part of 5 buy-ins in this short amount of time by just running in to bad players that couldn't fold. I was value betting the hell out of them and making a killing. Shortly after this session I switched most of my bankroll over to Party, and I haven't looked back since. If you've already got an account at Party, blow the dust off that old desktop icon and fire up some tables. If not, create your account and check the place out for yourself. Hopefully your first session is as fun as mine. The games at Party Poker aren't going to be soft forever. At this time of writing though (April 2019), let's just say I've been adding more money than ever to my weekend beer fund. It doesn't bother me if you move to Party Poker or not -- in fact I'd prefer it if you didn't. It's just that every day you spend playing at a different online poker room, is another day you've lost your chance to take advantage of some fish deciding to call all-in with K8o when you've got KK. It's a great feeling. If you use the bonus code BANKBONUS when creating your account, you'll get a bigger 100% up to $500 deposit bonus too. This is only if you use the bonus code though. When you're in the middle of your session, you'll want to make sure you're taking advantage of the colour coding feature. I've been tagging all the soft players (the loose-passive and bad loose-aggressive ones) with green notes. I've been tagging all the especially bad players with green notes, so I'm able to win even more money again by making sure I play as many pots as possible with the players I've marked. It's super handy. I don't need to persuade you to check it out. Feel free to join me, but if not, no worries. It's not going be to me leaving any money on the table in my next session.